I don’t normally write reviews of books written by lay members of the LDS Church; normally, I save my limited research time for books written by LDS General Authorities or Mormon apologists from BYU. However, I recently was perusing the offerings at a local Deseret Industry thrift store and came across a book penned by (as of 2014) a 76-year-old man named Charles Abbott. The title of the book that was written as a testimony of a man in the later years of his life was intriguing. It is no doubt a written witness for his future generations. “Should I buy it?” I asked myself. What the heck, it was only 50 cents, so what did I have to lose? As it turned out, his writing is very typical of the type of argumentation we hear on the streets when we’re sharing our faith. Thus, I think a review of this will be beneficial. As he tells it, Abbott grew up in a city 60 miles north of Seattle and was about to enter the University of Washington in Seattle. He met a Mormon girl, Oranee, and became enchanted, even though his faith–he belonged to a liberal Episcopalian church–was much different than Mormonism in many ways. To have a chance to win her affection, it became necessary for him to convert to Mormonism. He began to do some research, including checking out books written on different religions. On page 10, he writes, “What I learned is that there are many areas of disagreement among the Christian churches” (p. 10). He began to consider biblical passages, such as 2 Tim. 4:3-4, to point to the Mormon faith. He explained, “From the scriptures I also learned that a great apostasy from the teachings of Christ had been predicted long before the Council of Nicea” (p. 15). It is clear that there was a great apostasy which resulted in the loss of priesthood authority, the loss of leadership by prophets and apostles, and the loss of temples and temple ordinances, all of which have been restored. In addition there has been a restoration of baptisms for the dead and a restoration of a clear understanding of the preexistence, the purpose of life, and of eternal life with our loved ones (p. 93). If heavenly messengers (prophets who have lived upon this earth) have visited this earth in this dispensation, bringing messages from God, as claimed by the Prophet Joseph Smith, then we have the most important message that can go out to the world today, which invites investigation (p. 5). In his book, Richards “investigates” and concludes that Mormonism is true. How much did Richards’s opinion influence Abbott? Only Abbott will ever know, but it appears that many of Richards’s points played a role in Abbott’s book as well. joined the Church of Jesus Christ of Latter Day (sic) Saints when I was twenty years old. It was the best decision I have ever made in my life. Why? Because through my membership in the Church I have been blessed with everything that is really important (p. 1). In this book, Abbott reflects on the strengths of Mormonism compared to his former Episcopalian faith. As this review will show, his reasons seem to be surprisingly shallow for someone who spent his career as a lawyer. Let’s take a look at some of the reasons he uses to support the case of Mormonism and see if they stand the test. I determined right then and there to try to find out which of the many churches was right. As I studied the beliefs of the various churches I learned that the “Doctrine of the Trinity,” which has been accepted in one form or another by the Catholics and most of the Protestants, was the result of a political compromise engineered by Constantine, the Emperor of the Roman Empire, in the city of Nicea in 325AD (sic). Constantine wasn’t even a Christian, but instead was a sun-worshiper. However, in trying to unify the Roman Empire he felt it was important to reach some sort of unity among warring factions of the Christian Church (p. 12). The next thing I would recommend is to make sure the critic did not begin his argument with a false premise as its foundation. Often our most vocal critics will begin by defining what they think we believe and then attack that even though what they have described is not what we believe at all (p. 90). …there is one God who is a being composed of three individuals, the Father, the Son, and the Holy Spirit, all of whom are to be worshiped as the same God, and who share in the same substance or essence (God in Three Persons, p. 24). The conclusion that the Trinity is a “curious organization” based on a faulty definition of what the Trinity really is puts Abbott in a poor position. I’m sure he would have not gone into a courtroom (he apparently was an advertising lawyer, so I’m not sure what that entails) with a lack of understanding of what others really believe or were advocating. Understanding this doctrine for what it really says, not for what someone like Abbott interprets it to mean, is crucial. Otherwise, a straw man argument (like the one created by Abbott) can be made to look silly and nonthreatening. Stomping all over this false version and thinking it goes away is wishful thinking. There are many other places in the Bible that can be referenced. The Bible’s story, from beginning to end, shouts out how “God loves people.” Jesus came to this earth to provide the very thing most needed, which is forgiveness of sins. Thus, while we were still sinners, Christ died for us (Rom. 5:8). How much more compassionate can Someone be? God himself was once as we are now, and is an exalted man, and sits enthroned in yonder heavens! That is the great secret, if the veil were rent today, and the great God who holds this world in its orbit, and who upholds all worlds and all things by his power, was to make himself visible,—I say, if you were to see him today, you would see him like a man in form—like yourselves in all the person, image, and very form as a man; for Adam was created in the very fashion, image and likeness of God, and received instruction from, and walked, talked and conversed with him, as one man talks and communes with another” (Teachings of the Prophet Joseph Smith, p. 345. Italics in original. See also Achieving a Celestial Marriage, p. 129). We have imagined and supposed that God was God from all eternity. I will refute that idea, and take away the veil, so that you may see. These are incomprehensible ideas to some, but they are simple. It is the first principle of the Gospel to know for a certainty the Character of God, and to know that we may converse with him as one man converses with another, and that he was once a man like us; yea, that God the Father of us all, dwelt on an earth, the same as Jesus Christ himself did, and I will show it from the Bible (Teachings of the Prophet Joseph Smith, pp. 345-346. Italics in original. See also Gospel Principles, 1997, p. 305). Early “revelations” in the Doctrine and Covenants support the notion provided in the Book of Mormon. For instance, D&C 20:17-19 says, “By these things we know that there is a God in heaven, who is infinite and eternal, from everlasting to everlasting the same unchangeable God, the framer of heaven and earth, and all things which are in them; And that he created man, male and female, after his own image and in his own likeness, created he them; And gave unto them commandments that they should love and serve him, the only living and true God, and that he should be the only being whom they should worship.” And D&C 76:4 explains, “From eternity to eternity he is the same, and his years never fail.” These verses are completely contradicted by D&C 130:22 when it states, “The Father has a body of flesh and bones as tangible as man’s.” And this is the view held by LDS leaders today. Regardless of what the unique LDS scriptures say about God, the Bible is very clear about the nature of God and who He really is. For more on this issue and how Mormonism contradicts biblical Christianity, I recommend this article titled God the Father according to Mormonism. It is important to have a spiritual conversion instead of just an intellectual conversion. As you continue your activity in the Church you will find that there are many who seek to destroy your testimony by presenting what might seem to be good intellectual arguments. After I began to believe, in a purely intellectual sense, that the Church was true I followed Moroni’s instructions and committed the matter to prayer (p. 21). The problem is that it is necessary to have an “intellectual conversion” as well as a “spiritual conversion.” After all, isn’t that ultimately what Abbott would say has happened to him? According to his story, he intellectually read the Book of Mormon as well as studied other religions. When he read the Bible and looked harder at the doctrine of the Trinity, he came to the conclusion that this teaching cannot be true because it made no sense to him. It was very clear, he said, that the doctrines of Mormonism–the restored Gospel–are true to him because, in his mind at least, they make much more sense. And then he prayed according to Moroni 10:4-5 to determine for himself that the Book of Mormon is true. Christians also have “testimonies,” whether or not Abbott thinks their opinions are true. In fact, Christians are not just based on “facts” but are required to have faith. But what type of faith is it? Blind faith? Or faith which is the end result of going where the evidence leads? The leap of faith required to become a Christian is a leap into the light, not the dark. As Hebrews 11:1 puts it, “Now faith is the assurance of things hoped for, the conviction of things not seen.” Verse 6 adds that, without faith, “it is impossible to please him.” Christians are not rationalists like Thomas Jefferson (a Deist) who so abhorred miracles that he cut them out of his “Jefferson Bible.” To him, reason trumped faith, which he said should not be accepted unless there was empirical evidence. Without this type of evidence, then, Jefferson denied the historical Virgin Birth and the Resurrection, among other important doctrines. However, to the biblical Christian, reason and faith are friends, not foes. Reason is rigorously used, but there comes a place where the believer must take a leap and have faith. I too have a testimony that Jesus is my Lord and Savior. I believe this proposition is true even if I don’t have empirical evidence to support every aspect of my faith. However, I do believe that I can produce credible evidence to support the way I believe because I have gone where the evidence has led me. It is, then, a “reasonable” faith. My leap is within the realm of realistic possibility. It’s not fictional or make believe. If someone doubts that, then let’s compare the evidence. Over the years, as I have been immersed in the Church, the truth of its teachings has been reconfirmed and my testimony strengthened many times over, and the Holy Ghost has raised His voice above a whisper and even shouted at me more than once. Yet how does Abbott know that what his church has taught him is true? He has placed his eternal destiny into the hands of men such as Joseph Smith, LeGrand Richards, and Russell M. Nelson. These men have told him the type of faith he needs to have. Yet has he considered the possibility that they might be wrong? What if their teachings do not correspond to truth? This is a serious issue and needs to be evaluated. Just because Abbott is sincere doesn’t mean he can’t be sincerely wrong. . . no matter how hard he has prayed. When evaluating the arguments of critics we should first try to understand their motives and biases. We all filter what we hear and see through our own history of experiences, our own preconceptions, and our own sets of values. . . . When you hear someone criticize the Church or its teachings you should always consider the source. Was the speaker angry? Did he have a competitive motive? Did he examine the evidence objectively? This is a logical fallacy called “poisoning the well.” While it is true that everyone has presuppositions, the flavor Abbott gives is that if people criticize the LDS Church, they must be angry or not be looking correctly at the evidence. I just wonder at how seriously Abbott has considered the evidence against Mormonism from the viewpoint of those who happen to disagree. If Mormonism is true, then it shouldn’t be too difficult to show the errors in the critics’ thinking. He should forget about the motives of those on the other side, just as much as he should have ignored the motives of those whom he was countering in the court of law (i.e. were his legal opponents interested in making money? getting a guilty person off scotfree? or, just making a name of themselves?). Instead, Abbott should point out exactly what his opponents are saying is wrong and why he believers their evidence is faulty or their argumentation illogical. This shouldn’t be too difficult to do. (I don’t imagine that Abbott ever contested a prosecutor’s case by saying, “Your honor, the prosecution appeared to be angry and obviously has a competitive motive. I recommend you throw this case out!”) As my grandfather used to say, “It’s time to put on the big boy pants.” Abbott needs to quit judging motives and concern himself with showing the faulty logic of the opponent. Abbott makes another logical fallacy, this one being called a hasty generalization, when he writes on page 91, “Generally our most vocal critics are inactive members or past members of the Church and now they want to prove they are in the right.” Well, none of the six people associated with Mormonism Research Ministry has ever been LDS, yet we have all been called “anti-Mormon,” which might very well be taken as a “vocal critic.” I know many others who are also considered “anti-Mormons” who have never been members of the church. In June 2018 a new book that I have co-edited will debut. 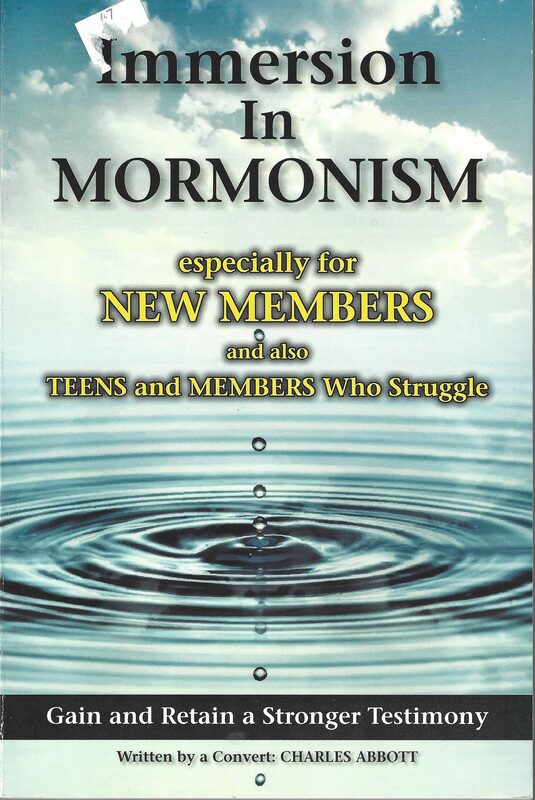 It is called Sharing the Good News with Mormons and includes 24 chapters written by 26 different authors, many of whom are in full-time ministry to those belonging to the cults, including Mormonism. Would you believe that 22 of these 26 authors have never been LDS? There goes that theory, out the door! Is Abbott willing to take an honest look at the evidence? Or has he become so close-minded due to his long-time membership in the LDS Church. I believe that Mr. Abbott was sincere in his opinion and thus assumed most people who are the most “vocal critics” of the church are former members. What other things could Abbott be mistaken about, regardless of his feelings? There are many who argue (1) that they have conclusive evidence that our beliefs are not true, or (2) that we have no concrete evidence that they are true. Then they present what they claim is proof that we are wrong. I believe that Jesus was such a good person He would not lie about his divine mission. Based on scriptural accounts I believe the apostles were also good people who would not lie. Some of them testified they saw the resurrected Christ. I believe they did. I also believe the witnesses who saw the plates from which the Book of Mormon was translated. I believe it is especially significant that even those witnesses who left the church after disagreements with Joseph Smith stuck by their statements about the plates even in the face of ridicule. I also view the coming forth of the Book of Mormon as nothing less than a miracle—especially coming from the mouth of an uneducated farm boy. First, it must be understood that the Book of Mormon witnesses did not see the plates with their literal eyes but rather in a vision. For more, go here. Second, the character of the witnesses is not a given. Consider this article by J. Warner Wallace, a cold-case detective from Los Angeles. Finally, as far as Joseph Smith being an “uneducated farm boy,” the fact that Abraham Lincoln had one-third of the formal education that Smith had shouldn’t mean we think less of the 16th president. Would we say Lincoln was “uneducated” or just didn’t have a “formal education”? Joseph Smith, Sr. was a school teacher and certainly must have had an influence on Smith. And when one considers the excellent handwriting of Joseph Smith, it can been seen that this young man was no “dummy.” He could read, write, and do many creative things. Later in his life, he self-educated himself in Hebrew and became an excellent orator. When people criticize the Church for a former practice of the Church that has been modified or abandoned they will point to the change and say it is proof that God does not lead the Prophet or the Church. If He did, He would not have had to alter something He had formerly established. However, a change means nothing of the sort. For example, the temple ceremony has had a few minor changes even in my lifetime. None of them change the central message of the instructions given, but they help us understand what is being taught more clearly (p. 102). At one time, Joseph Smith taught that God was from “everlasting to everlasting” (Moroni 8:18). Later, he changed his mind and said God was a man. The temple ceremony he mentions was supposed to have been given to the church through revelation, yet there have been a number of changes. Why does a ceremony given directly by God need to be changed? This is what happens when someone puts such blind and complete trust in his leaders. These men can completely change what was previously taught as gospel truth and the membership accepts it without asking questions. After all, they are “prophets” and I am not, the rationale seems to go. But there are reasonable arguments that a glass or two of wine or a cup or two of coffee each day can actually be good for you. There are also reasonable arguments that they are bad for you. To me none of that matters. I have a testimony that we are led by a Prophet of God. Until the Prophet tells me otherwise, I won’t use them. There is a lot I don’t understand in this life but one thing I do understand, and that is that the Lord’s prophet will not recommend any conduct that will interfere with our salvation. Indeed, a good case can be made for the positive benefits of both wine and coffee. (See this article in January 2018 titled “Is Coffee Healthy?” and this one titled “6 Reasons Why a Little Glass of Wine May do you Good.”) But notice his attitude: Drinking coffee/wine might be good or it might be harmful, but it doesn’t matter. I’ll just listen to what the prophet says. And then, if he changes his mind, I’ll listen to him and change my mind too. If this isn’t signify that someone belongs to a cult, then I don’t know what does. Ignore the critics. That’s what I do most of the time, and for a number of reasons. First, when it comes to our central beliefs, which are those things that deal with our eternal destiny, I haven’t found any arguments of critics that convince me. We are Gods in an embryonic state. Being the offspring of God, we have within us the elements of divinity. Therefore, when we do the wrong thing it is inconsistent with our divine nature (pp. 78-79). Such an idea does not come from the Bible. While it is true that Christians will be glorified at the end of time, this is not a “divine nature.” Only God is God. Our future nature (glorification) is not the same as divine. We are the only church which teaches that mankind lived in a preexistent state before coming to this earth. However, to understand the nature of the preexistence is to understand our relationship to God. . . . Critics who question this doctrine have a hard time explaining Jeremiah 1:5 . . .It must be noted that in the Dead Sea Scrolls there are frequent references to pre-earth life when we all lived as spirits with our Heavenly Father (pp. 104-105). First of all, bringing up Jeremiah 1:5—a common LDS biblical proof text for “preexistence” —is a weak support for this teaching. This verse is used to support the teaching that God had a relationship with Jeremiah (and all other humans) before birth. Is it possible that souls previously existed before life on earth? Not according to this passage or the rest of the Bible. First, it needs to be shown that God is the One who “chose,” “set apart,” and “appointed” Jeremiah to be a prophet. So, while the sovereign God knew Jeremiah, there is no evidence that Jeremiah knew God in the same way. In addition, the Bible explains that reincarnation is not possible because “now is the day of salvation” and that “it is appointed for people to die once—and after this, judgment” (2 Cor 6:2; Heb. 9:27). This verse is no help to the Mormon trying to defend the preexistence. Yet all Josephus’ statement tells us is that the Essenes held to a doctrine of immortality, not preexistence. What’s more, nowhere in the Scrolls do we find evidence that the Sect taught a preexistence for the human soul. Why are we here: There are differing opinions among the churches as to whether man is saved by grace or by good works, or by both. The scriptures of the restored church have clarified our understanding of what is required. We are the only church to teach that, because we are spirit children of God and therefore of his species, we have the capability to become like Him. In fact, the purpose of earth-life is to begin the process of eternal progression. As stated in 2 Nephi 15:23 (sic, should read 25:23), “it is by grace that we are saved, after all that we can do.” . . . The Dead Sea Scrolls state we can all progress to eventually become as a God (pp. 105-106). If parallels do exit (sic) between the Dead Sea Scrolls and Mormon doctrines, it is not because the two had a heterodox “pre-Christian Christianity” in common. Parallels could have been just as easily transmitted through the common Judeo-Christian heritage of ritual tradition from which many different Christian and non-Christian sects have borrowed. Much of what (Mormon writer Eugene) Seaich considers as parallels can be found in the Old and New Testaments. There is no need to resort to any secrets found in the ancient mystery religions. One erroneous teaching of many Christian churches is: By faith alone we are saved. This false doctrine would relieve man from the responsibility of his acts other than to confess a belief in God, and would tech man that no matter how great the sin, a confession would bring him complete forgiveness and salvation. What the world needs is more preaching of the necessity of abstaining from sin and of living useful and righteous lives, and less preaching of forgiveness of sin. This would then be a different world. The truth is that men must repent of their sins and forsake them before they can expect forgiveness. Even when our sins are forgiven, God cannot reward us for the good we have not done. More assertions were given by Abbott concerning the Dead Sea Scrolls. For a look at this issue, consider an article (with podcast series) that will be released on February 16, 2018. I fully understand what Charles Abbott is attempting to do. His goal was to write a book that his posterity would have to remember him and his faith even when he is long gone. To him, Mormonism is true, and he wants to help others “gain and retain a stronger testimony,” the exact words he uses at the bottom of his original book cover. However, he is required to possess blind faith. Despite a career of studying law, he seems content in ignoring the evidence brought forth by those outside the LDS Church. Unfortunately, he is forced into making logical fallacies. In the proverbial “Pascal’s Wager” move, Abbott is willing to bet his eternal life on Joseph Smith and the current Mormon leadership. However, if Mormonism cannot stand up to the truth, then perhaps it’s a religion that ought not to be followed, no matter how difficult it might be to abandon.